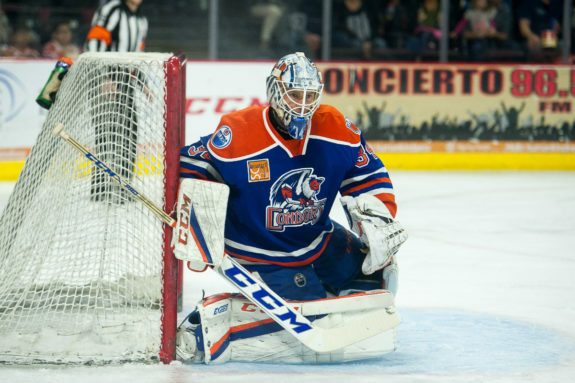 The Edmonton Oilers and Montreal Canadiens made a deal on Jan. 4 that sent back up goaltender Al Montoya to the Alberta capital. The return for the Habs was a conditional fourth-round draft pick in 2018. What is the condition tied to the pick and how can Edmonton avoid triggering it? The Canadiens will receive a draft pick from this trade no matter what. The question is whether it will be a fourth or fifth-round choice. Should Montoya play for the Oilers in seven or more games between the time of the trade and the conclusion of the 2017-18 regular season then the pick will be in the fourth round. Should he play less than seven games, it will be locked in as a fifth-round selection. You may have noticed that Montoya’s start versus the San Jose Sharks on Mar. 14 was his seventh appearance in an Oilers uniform. The pick, however, has not yet been locked in as a fourth rounder. The reason being, that in order for the condition to be triggered, the veteran netminder must be in the net for at least 30 minutes during a game in order for it to count towards the seven-game total. Looking at his game log, Montoya was in net for only 28 minutes and 21 seconds after relieving Cam Talbot versus the Buffalo Sabres on Jan. 23. That one minute and 39 seconds are what is keeping the pick from being a fourth-round selection in the upcoming draft. Is playing Montoya in one more game worth losing 31 spots in the draft? 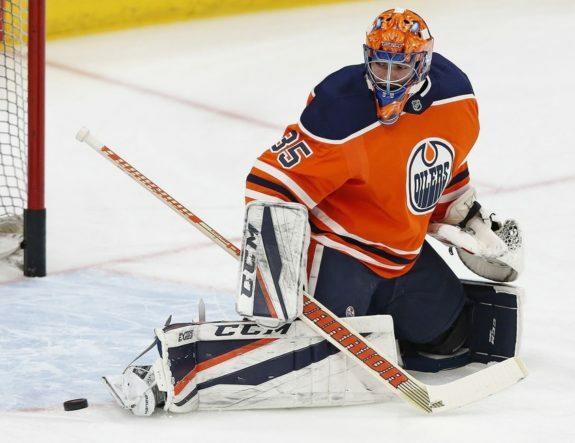 It’s no secret that the Oilers have heavily leaned on Talbot as their starting goaltender since acquiring him from the New York Rangers in June 2015. It’s also no secret that he prefers getting into as many games as he possibly can. So now, with the season lost and no playoffs to be rested for, there’s no need to sit their number one goalie. Related: Is Cam Talbot the Long-Term Answer for the Oilers? Talbot has battled through his fair share of struggles this season but is seemingly in the midst of turning things around. The focus for the Oilers should be to provide their first stringer with the biggest chance to regain his confidence heading into the offseason and hope that the positive momentum carries over to next year. This should be looked at as a win-win situation. Talbot gets his games and the Oilers only have to send a fifth-round selection to the Canadiens. One hiccup in the plan is that Edmonton plays their remaining 12 regular season games in a span of 23 days. This includes two sets of back-to-backs which means at least two probable starts for their backup goaltender. The Oilers have two goaltenders, Laurent Brossoit and Nick Ellis, who are at the crossroads of their careers. Both men are in their mid-twenties, are set to become free agents in July and are stuck in the AHL with the Bakersfield Condors. Their future with the Oilers can be considered murky at best. There would be no harm in head coach Todd McLellan giving one or both of these hopefuls a game or two in the NHL before the season is done. It would be a good opportunity for the goalies to showcase their talent while also providing the team with a chance to gauge whether or not they should re-sign the duo during the offseason. With Montoya not likely to factor into the Oilers plans next season, there is not much point in playing him again this season given the conditions attached to it. There are more beneficial short-term and long-term solutions for Oilers brass to consider.